This new volume in UQP’s History of the Book in Australia series explores Australian book production and consumption from 1946 to the present day. In the immediate postwar era, most books were imported into a colonial market dominated by British publishers. 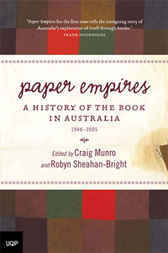 Paper Empires traces this fascinating and volatile half-century, using wide-ranging research, oral history and memoir to explore the worlds of book publishing, selling and reading. After 1945, Australian publishing went from a handful of fledgling businesses to the billion dollar industry of today with thousands of new titles each year and a vast array of imported books. Publishing’s postwar expansion began with the baby boom and the increased demand for school texts, with independent houses blossoming during the 1960s and 70s followed by the current era dominated by global conglomerates. All aspects of print culture are explored, from authorship and editing to bookselling, libraries and reading habits, in the context of today’s rapidly changing publishing landscape with its many technological challenges.A wide range of expert contributors, including book-trade practitioners, have produced this lively and indispensable account of our vital cultural industry. Craig Munro, former publishing manager at UQP, is the author of the award-winning biography Wild Man of Letters: The Story of P.R. Stephensen (1984) and a history of UQP, The Writer’s Press (1998). He won the Barbara Ramsden Award for Editing in 1985 and studied book publishing in Canada and the US on a Churchill Fellowship in 1991. He has been an adviser to the Literature Board of the Australia Council and was the founding chair of the Queensland Writers’ Centre.